When I was pondering my next Bible character biography, one particular story wouldn't leave my mind. It can be found in Numbers 22-24: the story of Balaam and Balak. And there's more than one interesting prospect in those three chapters. 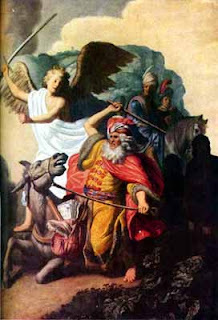 Balaam is perhaps the obvious choice, but a lot has been written on him. And, to be honest, I even considered (albeit briefly) the donkey. But, for this readthrough anyway, the character who grabbed me was Balak. Balak, son of Zippor, was a Moabite king whose story is told in the three chapters in Numbers mentioned above. He is also mentioned in Joshua 24:9, Judges 11:25, Micah 6:5, and Revelation 2:14. And the message he sent? Curse the Israelites so that he, and the Moabites, would have a fighting chance against them. Balaam refused a number of times, until he finally agreed to at least meet Balak (the donkey thing is in the story at this point - always makes me laugh!). So, the men prepared seven altars, and offered a bull and a ram on each. Balaam promises to tell Balak exactly what God tells him - but makes no promises as to the content. And, of course, Balak is disappointed when, instead of cursing these people, Balaam blesses them. But it never was. Each time - and a few times after that, Balaam blessed Balak's enemies instead of cursing them. Seems silly, doesn't it? Why, we ask, would this man think that looking at people from different perspectives might garner a different reaction from the Lord? But don't we do the same thing? We ask God for something, and we sense his answer. But we don't like it - so we ask again, another way. He closes a door for us, and we try to pry it open with our own power. He tells us to go, but we ask Him if we can do something else. Balak did eventually stop asking. He accepted that he couldn't manipulate the God of the Hebrews.